Mamadou Lo was born in a griot family in the Republic of Senegal,West Africa. 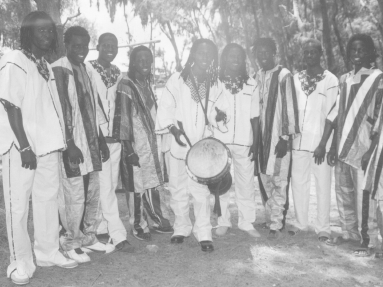 A griot is a hereditary musician and oral historian. His professional career has flourished since he was young. He plays 14 types of African drums, such as sabar, djembe and tama. In his home country, he played every year for St-Louis Jazz Festival, the largest one in Senegal, and appeared in programs including those by the National Broadcasting Service of Senegal, as well as in many collaborations with domestic and international musicians. In 2001, he formed an African percussion band, "SAFAIKO". In 2002, he formed "TAM-TAM SENEGALAIT". At that time he was based in Sapporo and held many live concerts across Japan. In his solo work, he appears in various music scenes and makes activities across many genres. Not to speak of playing instruments, he, as a songwriter, a composer, or an arranger, has created a lot of professional works. He has a reputation as a singer, too. In 2002, he was also a reporter for the TV broadcast program "My Land", a PR effort for the ODA program of the Foreign Ministry of Japan. So he introduced his motherland Senegal on television. He appears in many TV and radio programs as well as newspapers and magazines. He has contributed to international exchanges by attending international festivals and classes for international awareness as well as holding drumming workshops. In July 2005, he moved to Tokyo to broaden his activity. He plays African music, jazz, rock, Latin music, reggae, Japanese music and others. Besides working as a member of Bayefall Revolution, he has performed in TV programs and commercials. His other activities include holding drumming workshops and giving performance at museums, schools and hospitals for therapy. ABO(didge), Kazutoki Umezu(sax), Yousuke Onuma(g), Masahiko Kitahara(trombone) from Tokyo Ska Paradise Orchestra, Kosmas Kapitza(per), Akira Sakata(sax), Joe Yamanaka(vo), Takako Shirai(vo), Getao Takahasi(b), Toshiki Nagata(b), Kenichiro Niizawa(pf), Sachi Hayasaka(sax), Naoya Matsuoka(pf), Shuichi “Ponta” Murakami(dr), Yousuke Yamashita(pf), Kazumi Watanabe(g) and many others. In 2006, he appeared in a TV commercial of Kumi Kouda. In 2010, he joined STEVIE WONDER in his live performance at SUMMER SONIC 2010.
since 2006 / Copyright 2009 Mamadou Lo. All Rights Reserved.